A traditional herbal medicinal product for use in bruising exclusively based upon long standing use as a traditional remedy. Contains Arnica montana. Apply to the affected area 4 times a day, as required. Established in 1860, Nelsons is one of Europe's oldest homeopathic manufacturers and proud to produce family favourites that have been trusted for generations. Arnica montana is recognized for its beneficial natural properties. 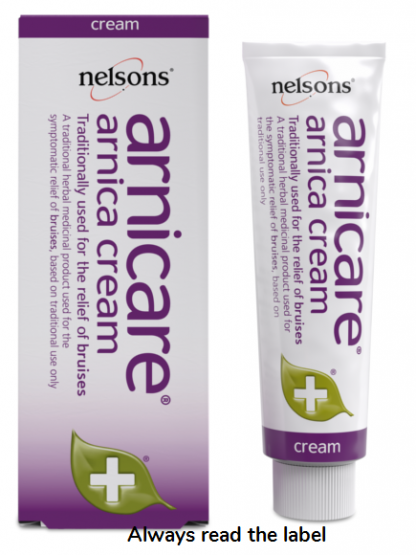 Our arnicare® products use Arnica montana sourced from the Scottish Highlands. Active ingredient:1g cream contains 9 mg of Arnica whole plant tincture (1:10) Extraction solvent Ethanol 57% v/v. Also contains:Purifed water, Glyceryl monostearate & Macrogol stearate, Apricot kernel oil, Theobroma oil, Glycerol, Cetostearyl alcohol & PEG-20 Stearate, Cetostearyl alcohol, Cetyl palmitate, Glyceryl monocaprylate, Methyl parahydroxybenzoate E218, Propyl parahydroxybenzoate E216. For use on the skin only. Before first use check tube seal is not broken. Pierce tube seal with point in top of cap before use. Adults, the elderly and children:Wash hands before and after use. Apply to the affected area 4 times a day, as required. Do not use more cream than the label/leaflet tells you to. Keep all medicines out of the reach and sight of children. Do not store above 25°C. Store in original container. Precautions: Do not use this product if you are allergic to any of the ingredients or to plants of the Asteraceae/ Compositae family (such as daisies, marigolds or artichokes). Do not use this product if you are pregnant or breastfeeding. Do not apply to broken or irritated skin. Keep away from eyes, mouth and nose. If symptoms worsen, or persist for more than two weeks, a doctor or a qualified healthcare practitioner should be consulted.